In the last update we looked at some of the reasons why lower lows are likely to follow Monday's low, while I noted that a snap-back rally could begin immediately. The market spent yesterday's session in rally mode, and closed near the high of the day, which fit the pattern -- so as yet I have no reason to alter my thesis that lower lows await. It's currently unclear to me if yesterday's high will mark all of the (assumed) corrective rally, or if the rally will turn into a two-legged ABC -- in either case, I expect SPX to close in the red today. There's no material change in the outlook for the S&P 500, so my best-guess projected path remains exactly the same as it was yesterday (though the price action did allow me to delete the rising blue line which was previously drawn in the place where Tuesday's rally has since occurred). 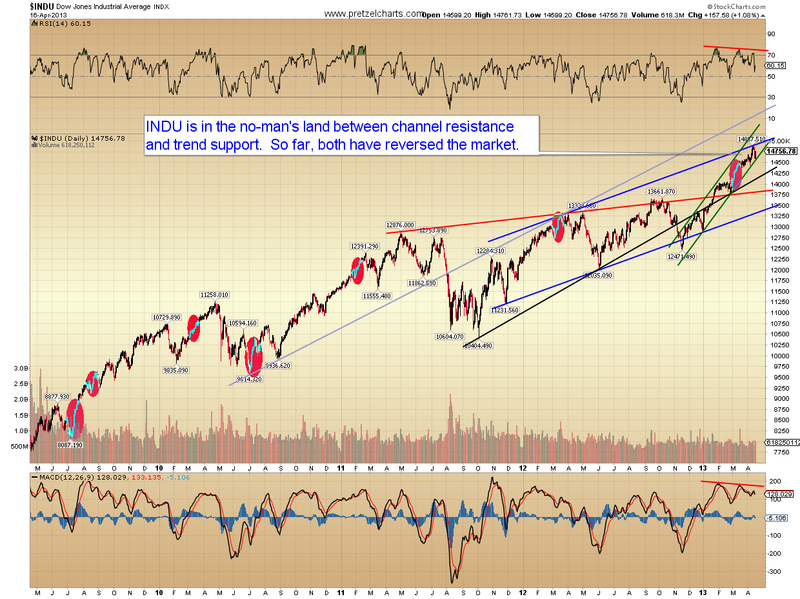 While I expect lower lows, we can't ignore the fact that SPX and the Dow Jones Industrials (INDU) both remain in technical uptrends. A breakdown of the rising green trend line on the chart below is the next step for bears to gain confidence. Incidentally, for those who still doubt the value of technical analysis, I would like to note that I charted the blue channel (below) a pretty long time ago -- yet the rally was rejected immediately upon running into the upper boundary of that "imaginary" channel, and the same occurred in reverse when it fell back to the rising green trend line. The next break of either will be telling. 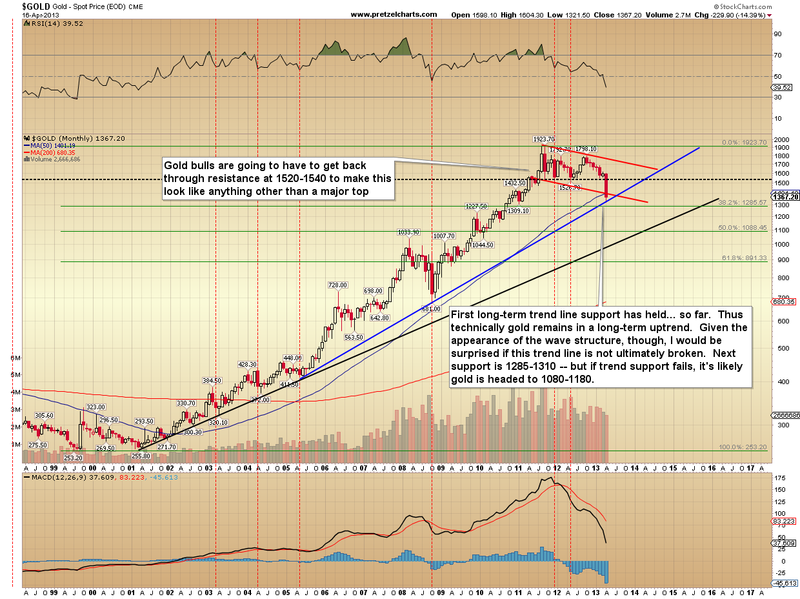 Finally, given the recent volatility in gold, it's time to update the long-term chart. Once again, simple trend lines worked their magic, as the recent decline found support at the rising blue trend line. 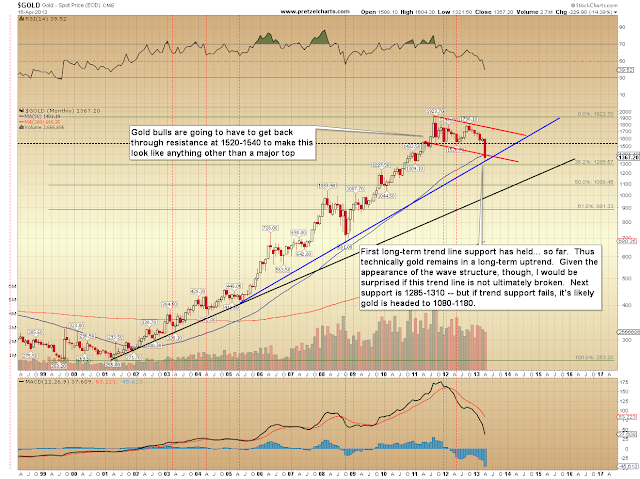 Given the wave structure, I would be surprised if gold does not ultimately break through that support level. I've outlined next support and some potential targets -- trade above key resistance is required for me to re-examine that outlook. Given the numerous failed retests of the all-time high and the subsequent breakdown of the topping pattern, it's hard to view the last couple years as anything other than a significant top. In conclusion, I continue to believe a more extended correction for equities has finally begun. 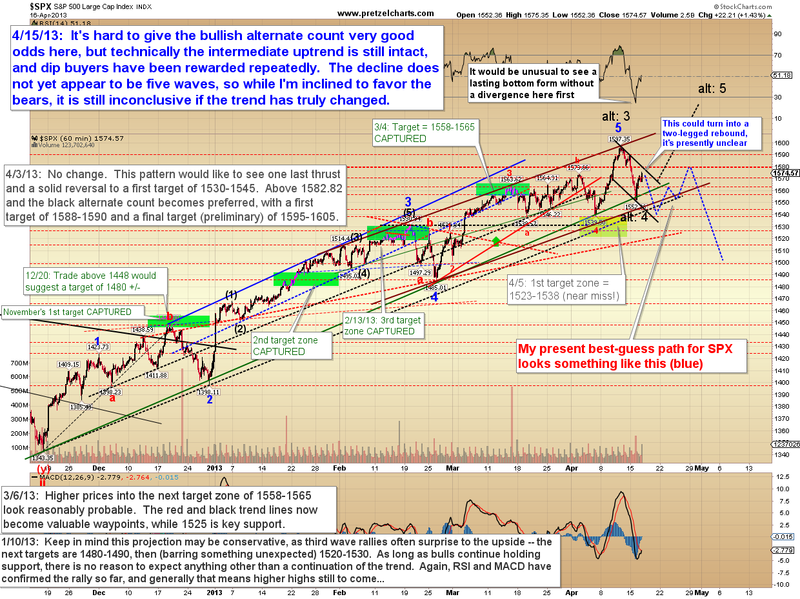 The first important upside level for SPX remains the same as yesterday, at 1580 +/-. Trade safe. Hi, in my opinion the market hasn't fully decided on the very long-term path yet, so I think a lot will hinge on how things play in the months going forward.